Sitar-player Anoushka Shankar and percussionist Kasiva Mutua explore the highs and lows of their musical careers. 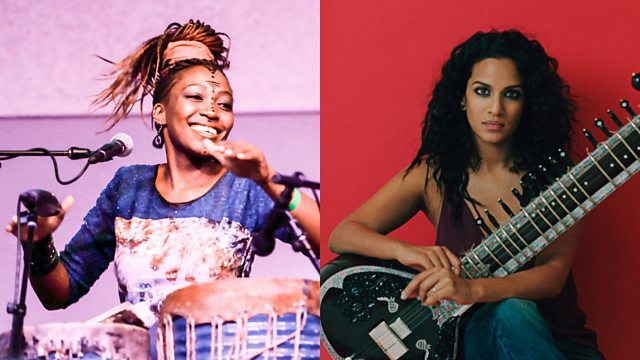 Anoushka Shankar on sitar and Kasiva Mutua on drums...two celebrated female musicians talk to Kim Chakanetsa about their paths to mastering instruments more traditionally played by men. Anoushka Shankar's father, the legendary Indian sitar player Ravi Shankar taught her to play the instrument from the age of 9. She first performed in public with her father at 13 and got a recording contract as soon as she finished school. She says growing up surrounded by music actually meant she had a complicated relationship with it, involving both love and fear. Despite that she decided to embrace the sitar on her own terms and is now heralded as probably the best female player in the world, making nine solo albums and receiving six Grammy nominations for her work. Anoushka says she's now experimenting with her music in ways she wished she had done 20 years ago. Kasiva Mutua is a Kenyan percussionist who discovered her love for drums at a young age, finding rhythms in her grandmother's stories and in the everyday sounds around her. She pursued drumming in secret throughout her teenage years before deciding to make a career of it - much to the dismay of her family and the wider community; female drumming in Kenya is considered taboo. Determined to follow her passion Kasiva is now an internationally touring drummer and part of the African music initiative The Nile Project. She says she had to fight to play - but it's all been worth it.